Goose Barnacle, a refined men's clothing shop on Atlantic Avenue, hosted their 8th artshow this past Thursday featuring artist Halley Zien. Halley is known for translating the human psyche and exaggerating our inner thoughts into caricatures. 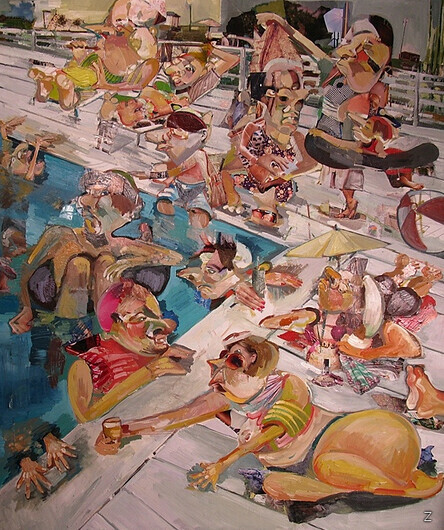 This colorful 60"x70" of "The Pool", caught my eye. 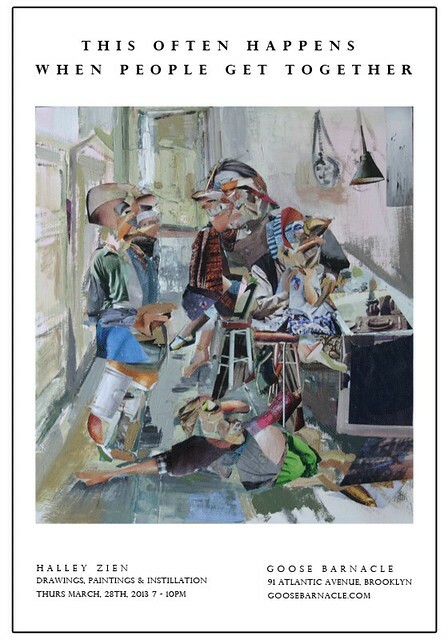 Halley distorts magazine cuttings of objects like a hand, sunglasses, or swimsuits and layers them into the artwork bandaging them so well that you really have to look up close to see what the images really are and how they translate to the painting. It's kind of like getting to know someone new and sorting out what you want to see vs who they really are vs what they're projecting. Very complex. Visit Goose Barnacle to see her artwork in person: 91 Atlantic Avenue, Brooklyn.